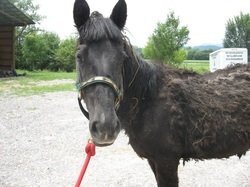 This page is specifically for individuals, groups, or businesses that would like to help or donate, but are not able to adopt a horse. At this time we are trying to add new stalls to our existing barn. The reason we require more stalls is most horses that are brought in to us need medical treatment or may need to be quarantined for various reasons. All those (business, groups, or individual) who help sponsor a stall (or part of a stall) will receive their name on the stall, recognition on the website and Facebook page, and acknowledgement at our biggest fundraiser at the Fall Festival at the John C. Cambell Folk School. All those that wish to donate to our cause please contact us directly at (828) 321-2376. Thank you to all those willing to help these incredible animals.